Hello friends! Michelle, the Graceful Yogi and a fellow teacher trainee of mine was kind enough to provide a post in my absence! Lucky you guys get some tips from an expert teacher and student with an abundance of experience with inversions. I had the honor of photographing her at Gasworks Park in Seattle this summer, and can’t wait to share more from the shoot with you! For Pincha Mayurasana, I start in a strong Dolphin pose with my forearms parallel and hands pressing firmly into the mat. I tuck my tailbone a little, engaging Mula Bandha and my core so that my torso is strong and integrated. Once I feel solid in my Dolphin, I shift my gaze forward between my hands. I lift my right leg high, careful to keep my hips as even as possible and keep my core engaged. I begin to shift my weight toward my hands and roll my left heel and eventually toe off the ground, bringing my hips over my shoulders. I slowly bring my left foot to meet my right in the air, keeping my gaze forward and my torso engaged. My hips are stacked direclty over my shoulders, and my shoulders are stacked over my elbows. to sustain Pincha, it is imperative for me to have my shoulders over my elbows, so that my arms make a right angle; this lets me use the structure of my skeleton to hold me up, taking some strain from my back and shoulder muscles. 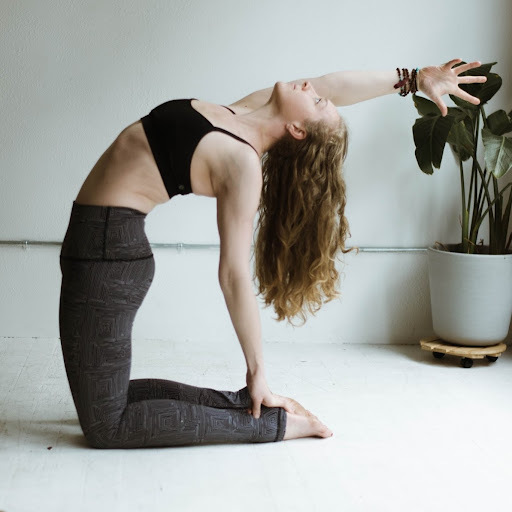 To do this, I press down through my hands, energetically lift my weight out of my shoulders, and find a tiny bit more backbend in the middle of my back. This is a VERY deep backbend (contortionists do it in the circus). A good indicator is to see if you can comfortably bring your forearms to the ground in Urdvha Danurasana, Wheel pose (guidance on this below). Vrischikasana is essentially the same shape, with the added challenge of bringing your feet to your head. From Pincha, I start by energetically lengthening my whole body toward the sky, creating space in my spine and lightness in my shoulders. I allow a little more bend in my mid-back, creating more of a crescent shape with my body. Once I feel stable there, I mentally glue my feet together and start to bend both knees so that my feet come toward my head. From here, it’s a balancing act. I think about the feeling of Urdvha Danurasana in my back as I shift my gaze a little further forward, out past my hands. My feet come over my head, my hips are over my mid-back rather than over my shoulders, and my shoulders have to shift slightly forward (NOT back! This will knock me over almost instantly) to counterbalance my hips. It is not uncommon for me to put a little too much weight forward and fall into Urdvha Danurasana from here :). Bring your right leg toward your head until it is mostly parallel with the ground as you bend your left leg so that the toes on both feet are pointing in the same direction. From here, begin to rotate your legs clockwise, bringing your right leg out to the side and extending your left leg to the other side, coming into a wide legged straddle; inverted straddles are a great passive stretch for the groin and release for the hip flexors. Continue rotating your legs clockwise until your left leg is extended over your head and your right leg is bent. Continue in the same direction or switch to counter-clockwise. It’s a fun balance challenge, and builds endurance in Pincha. Michelle Chambers I have always been in love with movement, using all of my being to express an emotion, an idea, a prayer. I did this through ballet for many years, until my body decided yoga was a better idea. I soon discovered that yoga was therapeutic not only for my aching back and joints, but also for my mind and even my soul. As I grew in my physical practice, I began to explore each asana as a means of expressing the love and gratitude in my heart. Inspired by this flow of grace, I completed a Vinyasa yoga teacher training with Silvia Mordini to share the freedom and joy of movement through the physical, mental, and spiritual practice of yoga.